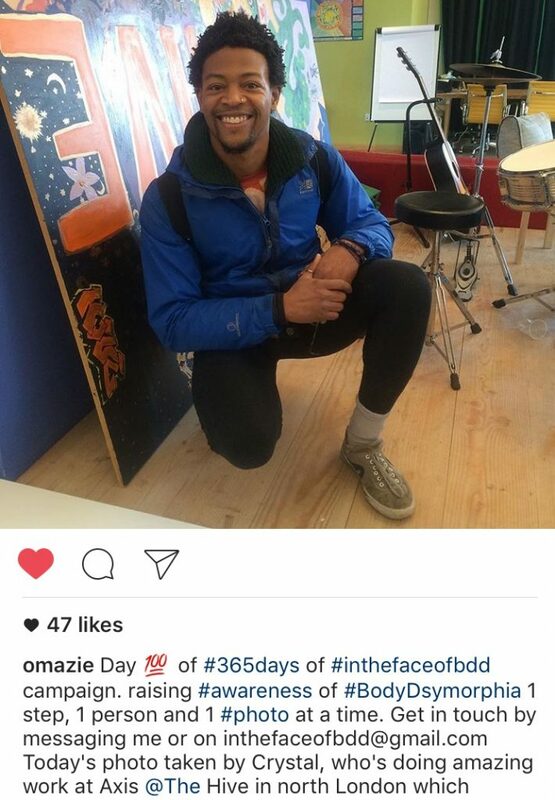 We would like to take this opportunity to draw your attention to an inspirational awareness campaign: “In the Face of BBD” started by @omazie (Omari) at the BDD Foundation Conference to support people to recover from Body Dysmorphic Disorder and find the courage to share with their loved ones. The campaign is simple: a 365 day challenge to inspire BDD sufferers to become BDD Warriors by posting a “No Safety” photo (#Onetake, #Nofilter and #Noselfie) of themselves taken by a loved one every day for a year. Please search for @omazie on Instagram to participate, follow and/or show your support for the campaign or email Omari at inthefaceofBDD@gmail.com. For updates also consider following the BDD Foundation on Twitter & Facebook @BDDFoundation or searching the hashtag #inthefaceofBBD. Omari recently reached 100 days which means at least 100 strangers know about BDD and Omari has faced 100 exposure exercises. We are truly in awe of his dedication and courage in spreading awareness about Body Dysmorphic Disorder. Soul Relics is an online platform on storytelling, objects and mental health. We anchor our memories with objects. By creating an open platform for connections to form between our individual stories, and letting each person use objects to express a fragment of past/present personal account of mental ill health and recovery, we hope to create a collective message that transcends barriers between people, and challenges the stigma surrounding mental health. 1 in 4 people will experience a mental health problem in any given year. However, although there is an increase in awareness of mental health, there is still a lack of understanding about the issue. Many stories are untold, hidden, or suppressed. (2) Something that helped one work towards recovery. That object can be anything of personal significance, or/and represent institutional barriers to mental health care, etc. Ultimately, we hope the platform will capture both unique experiences and common themes. We wish to provide a new way for people to tell and understand others’ stories. As part of their Anorexia Awareness Week program, UCLA presents a very exciting and educational event, “Body Dysmorphic Disorder Explored,” that investigates the intersection of art and science, bringing together international, multidisciplinary artist Leigh de Vries and leading body dysmorphic expert Dr. Jamie Feusner, Professor-in-Residence in the UCLA Department of Psychiatry and Biobehavioral Sciences, at the De Neve Auditorium on UCLA’s Westwood campus March 2 from 6-9pm. Co programmed by two UCLA undergraduate groups – Active Minds and the Student Wellness Commission Body Image Task Force, the event will revolve around artist Leigh de Vries’s short film “Exposure: The Broken Reality Tunnel,” brief talks from each, and then a Q&A session around the urgent topics of Body Dysmorphic Disorder (BDD) and eating disorders and how these disorders can intersect. For more information on artist Leigh de Vries’s work and to RSVP for the event, please see http://mybrokenreality.com/. For media assistance or event attendance please contact Susan von Seggern on susan@susanvonseggern.com or +1 213-840-0077. UK artist, Leigh de Vries 1st solo exhibition in Los Angeles. UCLA presents a very exciting and educational event, “#MyBrokenReality – Understanding Body Dysmorphic Disorder (BDD) and Eating Disorders,”. 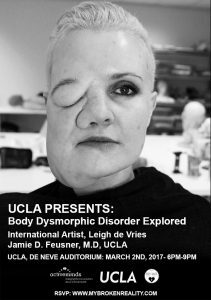 The event explores the intersection of art and science, bringing together international, multidisciplinary artist Leigh de Vries and leading body dysmorphic expert Dr. Jamie Feusner, Professor-in-Residence in the UCLA Department of Psychiatry and Biobehavioral Sciences. “When I first viewed this I literally experienced chills from how emotionally powerful and on-point it is. These are the voices of my patients over the past 12 years! The full video within the installation is longer and includes the spoken thoughts and feelings of several other people with BDD. 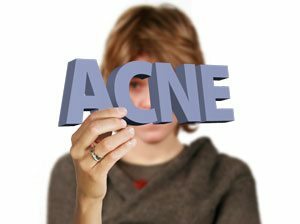 – Jamie D. Feusner, M.D.